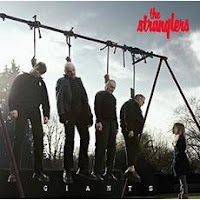 It's been a long time since I've spent time listening to The Stranglers, but with the punk legends set to release their seventeenth album, Giants, on May 28th, I thought it was about time. I must say, the music the band is making now bears little resemblance to that which put them on the map. I suppose with age comes evolution, and the loss of a sense of urgency. However, early '80s-style keyboard sounds are indicative of a band who have stalled rather than continued to evolve. The title track begins with a strong blues rock riff. That promise is quickly dashed as the riff is drowned out by a grating keyboard that sounds more like a child's toy than a real instrument. A strong hook on "Freedom Is Insane" helps atone for the meandering New Age-y arrangement. "Mercury Rising" has more in common with "She Blinded Me With Science" than it does with anything resembling punk rock. Songs like "Lowlands" and "Boom Boom" so finally give us some sustained oomph, but that oomph is at half speed. "Time Was On My Side" is the first true sign of life, with beefy vocals in the verses...which get stomped on by a listless chorus. The record's strongest track is actually the opening instrumental number "Another Camden Afternoon". It blends the angular guitar sound of Fugazi with the spiderweb organ ramble of The Doors to surprisingly intriguing results. Of course, that's far too little to make up for the omnipresent keyboards and (*gasp*) brushed drums. The Stranglers play the Danforth Music Hall in Toronto on May 31st. Best tracks: "Another Camden Afternoon", "Time Was On My Side"